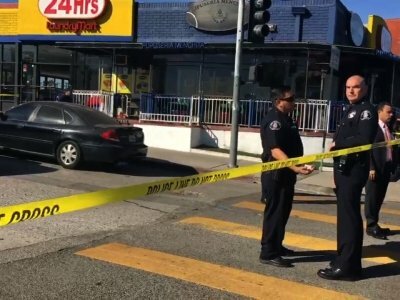 LOS ANGELES (AP) — A shooting at a Los Angeles middle school classroom Thursday that left one boy in critical condition, injured four others and had panicked parents in tears was an accident, police said. The shooting was reported just before 9 a.m. and within minutes a 12-year-old girl was taken into custody without incident. Police interviewed her and by evening they announced that they would book her on a charge of negligent discharge of a firearm on school grounds. The determination capped a frantic day at Salvador B. Castro Middle School in downtown Los Angeles and corroborated what some students told reporters after the lockdown was lifted and they were reunited with parents on the school’s athletic field. In a telephone interview with his mother alongside, Jordan Valenzuela, 12, told The Associated Press he was in the classroom next door when he heard a loud bang. He said he talked to the girl just after the shooting and she was sobbing. “She was like, ‘I didn’t mean to. I had the gun in my backpack and I didn’t know it was loaded and my backpack fell and the gun went off,’” he said. Shortly after that he said the girl asked him to hide the weapon. Shallin Lopez, a seventh-grader at the school, was in the room at the time of the shooting. She said she never saw a gun. Police recovered a semi-automatic handgun after the shooting. TV video from helicopters showed a dark-haired girl in a sweatshirt being led from the school in handcuffs as anxious parents and family members gathered on a street corner, many crying and talking on their phones as they waited. Diego Salinas had just dropped off his 12-year-old sister and was stunned when she called minutes later to say there had been a shooting. Claudia Anzueto, Jordan Valenzuela’s mother, said the boy was crying when he called her from a borrowed cellphone to tell her he was OK.
Student Melanie Valencia, 13, said the school did a random security search Thursday, but that she’s never been checked. The most seriously injured victim, a 15-year-old boy shot in the head, was taken to Los Angeles County-USC Medical Center and remained in intensive care during the afternoon but was doing well. A 15-year-old girl with a gunshot wound to the wrist was hospitalized in fair condition. An 11-year-old boy and a 12-year-old girl were grazed and were treated and released from the hospital. A 30-year-old woman who was treated after the shooting was not hospitalized and the nature of her injury was not immediately known. The school’s campus was placed on lockdown but most classes continued. The school has about 365 students in grades 6-8 and almost all are Hispanic and many are from low-income families. Associated Press writers Christopher Weber, John Antczak, Michael Balsamo, Krysta Fauria and Brian Melley in Los Angeles contributed to this report.